← Headship tomorrow and headship yesterday, but never headship today. 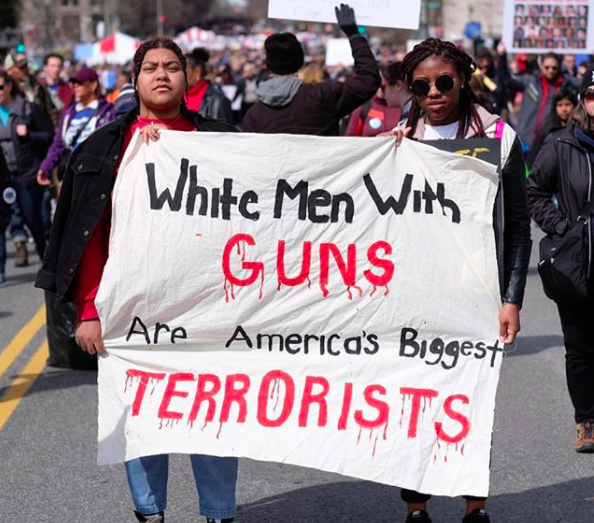 Maybe all the white men with guns should stop responding to calls for help from anyone who isn’t white? Seems like that’s what they want, yes? I imagine all the police, armed security, and good Samaritans are tired of being crapped on by spoiled ethno-centrics, and if we give them what they want, maybe they’ll be happier. Spoken by people who are not true Americans. The perversity of this age. I wonder what kind of thought “process” these dolts engage in to come up with these protest signs. Do they sit around swapping random witticisms which only they find insightful and then have a vote to commit it to paper? Do they not realize this bumper-sticker wisdom is neither insightful nor funny? Been living with a white guy with guns for almost forty-one years and haven’t felt unsafe (much less terrorized) once.